The Disk Image Backup retains the information and the structure (including partition) of the backed up drive. During the restore process, it ensures that the image drive is recovered as is, and hence it makes the space on the destination drive to match its own size. For example, if you restore a 100 GB disk image file to a 500 GB hard drive partition, your partition will shrink to a 100 GB drive after the recovery. 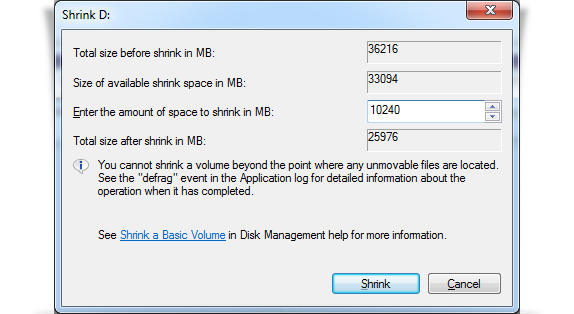 To handle this storage shrink, create the destination partition same as that of disk image file size that you wish to recover. You may refer the below steps for re-partitioning. Right-click the image file (IDriveDiskImage.img), click 'Properties', and note its file size. Go to 'Control Panel' > 'Administrative Tools' > 'Computer Management', and on the left pane click Disk Management under 'Storage'. Note: A simpler method to launch the Disk Manager is to go to the 'Run' command window and execute diskmgmt.msc. In the lower section, right-click the destination drive you choose for restoring the image file, and click 'Shrink Volume'. The Shrink drive pop-up appears. Enter the space you need on the newly partitioned drive (in megabytes), sufficient enough to restore the image file, and click 'Shrink'. An unallocated drive appears. Right-click the unallocated drive, click 'New Simple Volume' and follow the wizard. A new drive has been created. Now, you can restore your image file to the newly created partition.